Using electrophoretic mobility shift assays, we examined sequence-specific binding of DEK, a potential autoantigen in juvenile rheumatoid arthritis, to conserved Y-box regulatory sequences in class II MHC gene promoters. Nuclear extracts from several cell lines of different phenotypes contained sequence-specific binding activity recognizing DRA, DQA1*0101, and DQA1*0501 Y-box sequences. Participation of both DEK and NF-Y in the DQA1 Y-box binding complex was confirmed by 'supershifting' with anti-DEK and anti-NF-Y antibodies. Recombinant DEK also bound specifically to the DQA1*0101 Y box and to the polymorphic DQA1*0501 Y box, but not to the consensus DRA Y box. Measurement of the apparent dissociation constants demonstrated a two- to fivefold difference in DEK binding to the DQA1 Y-box sequence in comparison with other class II MHC Y-box sequences. Residues that are crucial for DEK binding to the DQA1*0101 Y box were identified by DNase I footprinting. The specific characteristics of DEK binding to these related sequences suggests a potential role for DEK in differential regulation of class II MHC expression, and thus in the pathogenesis of juvenile rheumatoid arthritis and other autoimmune diseases. Although juvenile rheumatoid arthritis (JRA) is the most common cause of disability in children, its etiology is unknown. Immune dysregulation appears to play a key pathogenic role, as circulating autoantibodies are common in patients with certain JRA clinical subtypes [1–7]. Two recent studies have shown a highly significant association between early-onset pauciarticular JRA and circulating antibodies to the 43-kDa nuclear protein DEK [8, 9]. Although circulating DEK antibodies have subsequently been found in children and adults with other autoimmune diseases [10, 11], these two studies did reveal that children with JRA are significantly more likely to have anti-DEK antibodies than are children without rheumatic disease. Children with pauciarticular-onset JRA were also significantly more likely to have anti-DEK antibodies than were children with polyarticular-onset or systemic-onset JRA or other rheumatic diseases. Among children with pauciarticular JRA, DEK autoantibodies were significantly more common in those with JRA-associated uveitis than in those without eye disease [8, 9]. DEK reactivity was also found to be strongly associated with onset of any JRA subtype before age 6 years . DEK is a nuclear protein that is not structurally related to any known family of proteins [12, 13]. Although it may also participate in DNA replication and RNA processing [14, 15], we have identified DEK as a DNA-binding protein that recognizes the TG-rich peri-ets (pets) regulatory element in the human immunodeficiency virus type 2 (HIV-2) enhancer . The pets site is important in mediating HIV-2 enhancer stimulation in activated T cells and monocytes [17–19], suggesting that DEK may play an immunomodulatory role as it participates in transcriptional activation through this and related sites. Observed sequence similarity between the DEK-binding site in HIV-2 and the highly conserved Y-box regulatory element in MHC class II gene promoters pointed to the Y box as one possible related site. NF-Y binding to the MHC class II gene Y box anchors a complex assembly of nuclear proteins that occupies several regulatory elements over a great distance [20–22]. In the DQA1 promoter Y box, a reverse CCAAT motif with a partially overlapping TG-rich sequence shares sequence identity with the HIV-2 DEK-binding site at 7 of 10 positions (Fig. 1). In the DQA1*0501 allele, which is highly associated with predisposition to autoimmune disease [23–27], the Y box contains a single-nucleotide polymorphism that reduces sequence identity to 6 of 10 positions. We hypothesized that DEK could bind in a sequence-specific manner to the Y-box motifs in the promoter regions of several class II MHC genes, and that gene- and allele-specific Y-box polymorphisms could affect DEK binding activity. In this study, we examine the characteristics of DEK binding to the Y-box sequences of DQA1*0101, DQA1*0501, DRA, DQB, and DRB. We also confirm participation of DEK with NF-Y in the DQA1 Y-box binding complex and localize specific DEK binding within this sequence. As the Y-box promoter element is crucial to the regulation of MHC class II gene expression, sequence-specific binding to this motif indicates a potential role for DEK in modulating normal and abnormal immune response. EMSA probes and competitors: HIV-2 DEK-binding site, class II MHC Y-box motifs (DQA1, DRA, DQB, and DRB), and related sequences. Probes and competitors include only sequences 3' of the ● symbol. X boxes are shown to provide a broader context for the Y-box regulatory element. EMSA = electrophoretic mobility shift assay. Cultured cell lines were grown and harvested and nuclear extracts were prepared from resting cells as previously described [28, 29]. Construction of the poly-histidine-tagged DEK bacterial expression vector is described elsewhere . Full-length DEK or antisense DEK was prepared from cultures grown from individual colonies to log phase, induced with 1 mm isopropyl thiogalactose, and harvested by centrifugation after 4 hours. Recombinant protein was purified from bacterial lysates in accordance with the published method for the QIAexpress system (Qiagen, Valencia, CA, USA) with variations in Buffers B and D as noted in Additional file: 1. Procedures were carried out at 4°C; dialyzed recombinant DEK protein (rDEK) was stored at -80°C. A FLAG-tagged DEK adenoviral vector constructed by the University of Michigan Vector Core was used to transduce T98G cells (ATCC) by incubation for 48 hours before harvesting for immunoprecipitation. FLAG-DEK was immunoprecipitated using anti-FLAG resin (Sigma-Aldrich, St Louis, MO, USA) in accordance with the manufacturer's instructions and was eluted by competition with peptide containing three FLAG recognition epitopes. EMSAs were carried out as previously described , using 0.1–0.25 ng of radiolabeled oligonucleotide probe (2.5 × 104 counts per minute) per 15 μl binding reaction and 5 μg of nuclear extract (except as noted) or <1 μg of rDEK. For competition EMSAs, unlabeled double-stranded oligonucleotide was added to reaction mixtures before the radiolabeled probe. For antibody supershift of binding complexes, 1 μl anti-NF-YA antibody (gift of JP-Y Ting) or 1 μl high-titer anti-DEK human serum (gift of W Szer ) or 2–3 μl control human serum was added to the binding reaction, and the mixture was incubated on ice for 2 hours before the probe was added. % free DNA = Kd[app]/(Kd[app] + [protein]). From this equation, the apparent Kd corresponds to the protein concentration at which half of the DNA is bound . The 148-bp probe included DQA1*0101 promoter sequence from -53 to -200. 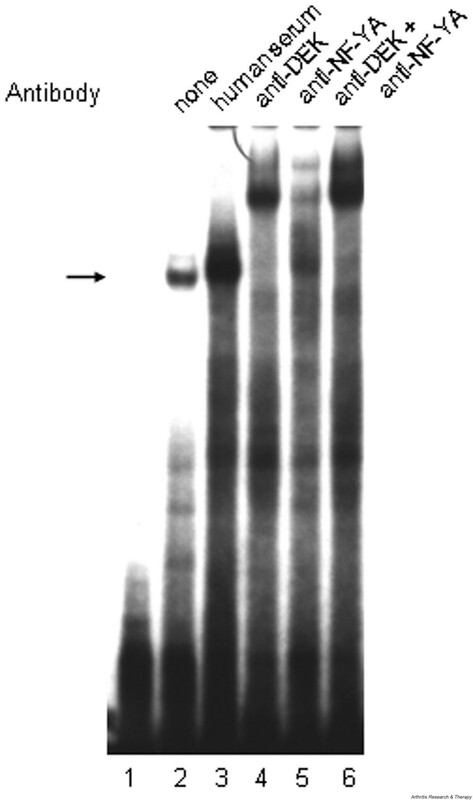 PCR primer (200 ng) for probe sequence was end-labeled with 32Pγ-ATP and T4 polynucleotide kinase (New England Biolabs, Beverly, MA, USA), and was column purified. Labeled antisense primer (200 ng) and 200 ng unlabeled sense strand primer (or vice versa) were used in each 50.5-μl PCR reaction, with 0.2 mM dNTP, 1.5 mM MgCl2, 5 μl 10X PCR Buffer (Invitrogen, Carlsbad, CA, USA), and 1 μg Namalwa genomic DNA. Taq polymerase (Invitrogen) was added at 80°C after a 94°C 'hot start,' initiating 35 cycles of PCR: 94°C for 45 s, 55°C for 30 s, and 72°C for 90 s, with final extension at 72°C for 10 min. PCR products were purified with a High Pure PCR Product Purification Kit (Roche Applied Science, Indianapolis, IN, USA) and then used at 2.5 × 104 CPM/2 μl. DNase I digestion reaction and footprinting gel followed published techniques . The similarity of the DQA1*0101 Y-box sequence to the HIV-2 DEK-binding site (see Fig. 1) first led us to investigate whether DEK in nuclear extracts binds to MHC class II Y-box regulatory elements in vitro. With a double-stranded oligonucleotide probe containing the HLA-DQA1*0101 Y-box sequence, EMSAs revealed similar binding activity in nuclear extracts from B lymphoid (Namalwa), T lymphoid (Jurkat, CEM), monocytoid (U937), and HeLa cell lines (Fig. 2), and in nuclear extracts from SKW 6.4 (B lymphoid), KG-1 (T lymphoid), and HL-60 (monocytoid) cell lines (not shown). Electrophoretic patterns with a probe corresponding to the DQA1*0501 Y-box sequence, which diverges from the DQA1*0101 Y-box sequence by a single base pair within the highly conserved reverse CCAAT sequence, appear to vary with the cell type, and binding appears weaker than with the DQA1*0101 probe (see Fig. 2). Nuclear extracts from several cultured cell lines show DQA1 Y-box-specific binding activity. Oligonucleotide probes containing the DQA1*0101 Y-box sequence (lanes 1–7) or DQA1*0501 polymorphic Y-box sequence (lanes 8–12) bind protein in nuclear extracts prepared from resting cells of the indicated cultured cell lines. Lane 1, control without nuclear extract; lanes 2 and 8, 2.5 μg of protein; lanes 3–7 and 9–12, 5 μg of protein. 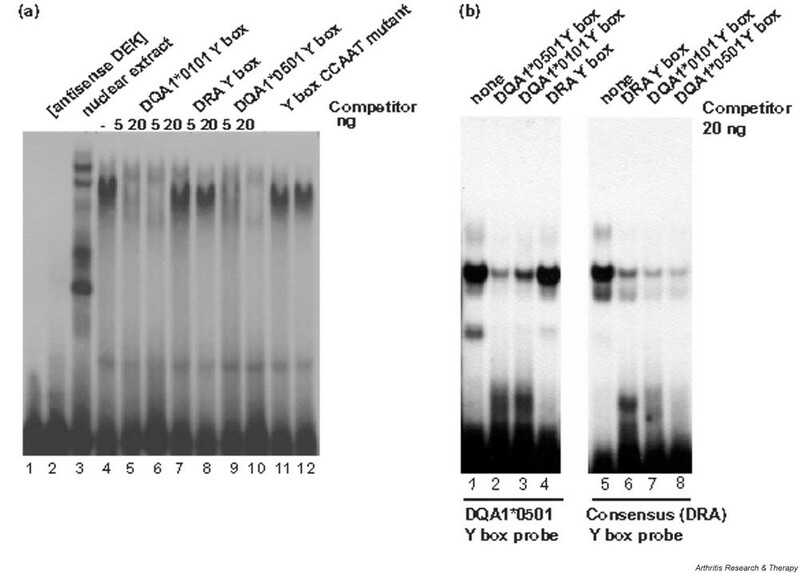 Competition EMSAs demonstrated sequence-specificity of the DQA1*0101 Y-box binding activity (Fig. 3a). 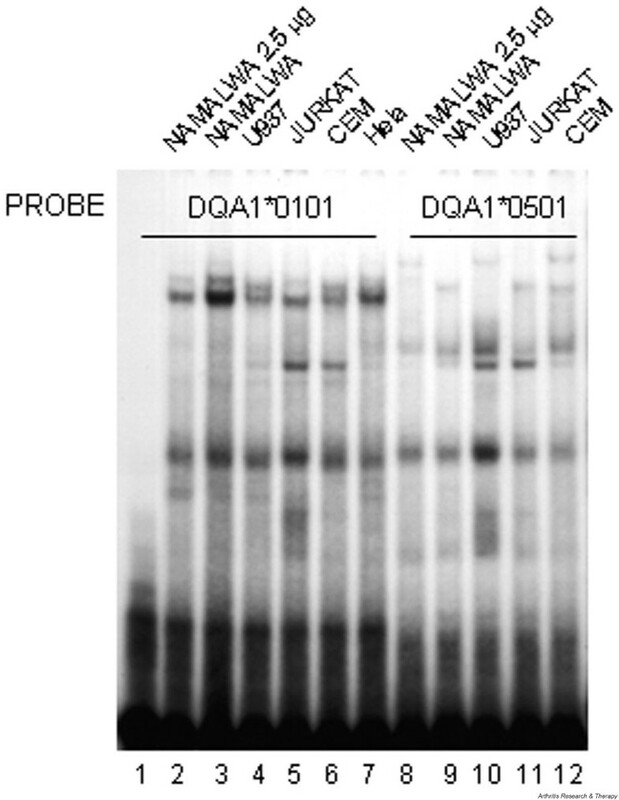 Unlabeled DQA1*0101 oligonucleotides successfully competed for strong binding activity seen in nuclear extracts from the Namalwa B cell line (Fig. 3a, lanes 3 and 4), whereas unlabeled DQA1*0501 Y-box sequence competed less well (Fig. 3a, lanes 5 and 6). There was no competition when the Y-box reverse CCAAT motif was mutated at all five positions (Fig. 3a, lanes 7 and 8), nor with the unrelated HIV-1 κB sequence (lane 10). DEK has been shown to bind to the HIV-2 pets site , but oligonucleotides containing this sequence also failed to compete significantly (lane 9), suggesting that factors other than DEK play a role in determining the specificity of this complex. In particular, NF-Y is the predominant nuclear factor binding to the Y box , and the HIV-2 pets site does not contain the reverse CCAAT sequence required for NF-Y binding. Namalwa cell nuclear protein(s) bind to DQA1 and DRA Y-box elements. 5 μg of Namalwa cell nuclear extract (lanes 2–10) and unlabeled oligonucleotide competitors were added to the binding reaction before addition of the radiolabeled DQA1*0101 probe (a) or the radiolabeled DRA probe (b) to define the sequence specificity of nuclear protein binding. In both (a) and (b), lane 1 contains no protein. See Figure 1 for site mutant and CCAAT mutant sequences. pets = peri-ets. The consensus (HLA-DRA) Y-box sequence differs from the HLA-DQA1*0101 Y box by a single nucleotide immediately 5' of the reverse CCAAT pentamer; this single-nucleotide polymorphism significantly changes the electrophoretic pattern (Fig. 3b) in comparison with that seen with the HLA-DQA1*0101 probe. HLA-DQA1*0101 oligonucleotide also competes poorly with the consensus Y-box probe for binding (Fig. 3b, lanes 5–6). Divergence of the HLA-DQA1*0501 Y-box sequence at one position within the required NF-Y binding site reduces its ability to compete with the DRA Y-box probe (Fig. 3b, lanes 7–8) as much as does mutation of all five nucleotides within the CCAAT sequence (Fig. 3b, lanes 9–10). Participation of both DEK and NF-Y in the DQA1 Y-box binding complex was confirmed by using high-titer anti-DEK antiserum (gift of W Szer ) and monoclonal antibody to the NF-YA subunit of the Y-box binding factor (gift of JP-Y Ting) to further retard the mobility of the DQA1 Y-box binding complex ('supershifting') (Fig. 4, lanes 3–4). Preincubation of Namalwa cell nuclear extracts with antibodies to NF-YA also retards the binding complex (Fig. 4, lane 5), leaving a residual band (arrow) which can be attributed to distinct DEK binding activity. Preincubation with both antibodies results in further retardation of the binding complex to form a doublet (Fig. 4, lane 6). 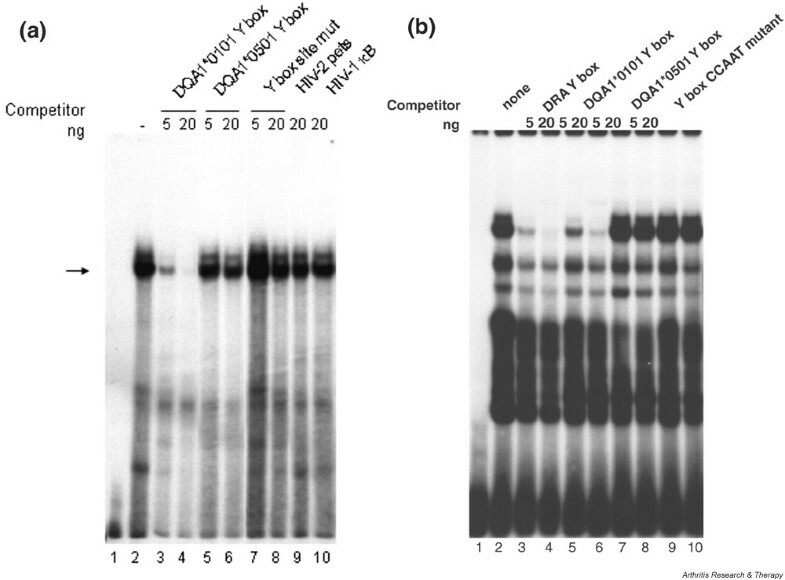 The same electrophoretic patterns were seen after preincubation of nuclear extracts from the CEM T lymphocytoid cell line with anti-DEK and anti-NF-YA antibodies (data not shown). DEK and NF-Y participation in the DQA1*0101 Y-box binding complex demonstrated by 'supershift' assay. Namalwa nuclear extract (5 μg) was preincubated with the following antibody reagents before addition of radiolabeled probe containing DQA1*0101 Y-box sequence: lane 2, no antibody reagent; lane 3, 2 μl normal human serum; lane 4, 1 μl high-titer anti-DEK human antiserum; lane 5, 1 μl anti-NF-YA (subunit) monoclonal antibody; lane 6, 1 μl of anti-DEK plus 1 μl of anti-NF-YA monoclonal antibody. Lane 1 contains probe without nuclear extract or antibody reagent. Having established that DEK and NF-Y in nuclear extracts participate in the HLA-DQA1*0101 binding complex, we used recombinant full-length DEK (rDEK) to determine whether it alone can bind to Y-box motifs and to examine how gene- and allele-specific sequence polymorphisms alter its binding. The HLA-DQA1*0101 Y-box sequence does bind rDEK specifically, with unlabeled probe sequence competing successfully for binding (Fig. 5a, lanes 4–6). In contrast, despite its identity at 9 of 10 positions, unlabeled consensus (DRA) Y-box sequence (Fig. 5a, lanes 7–8) competes very poorly against the HLA-DQA1*0101 Y-box probe. DQA1*0501 Y-box sequence (Fig. 5a, lanes 9–10) competes only slightly less well than does DQA1*0101, indicating that a change in the residue at position 7 does not prevent rDEK binding. 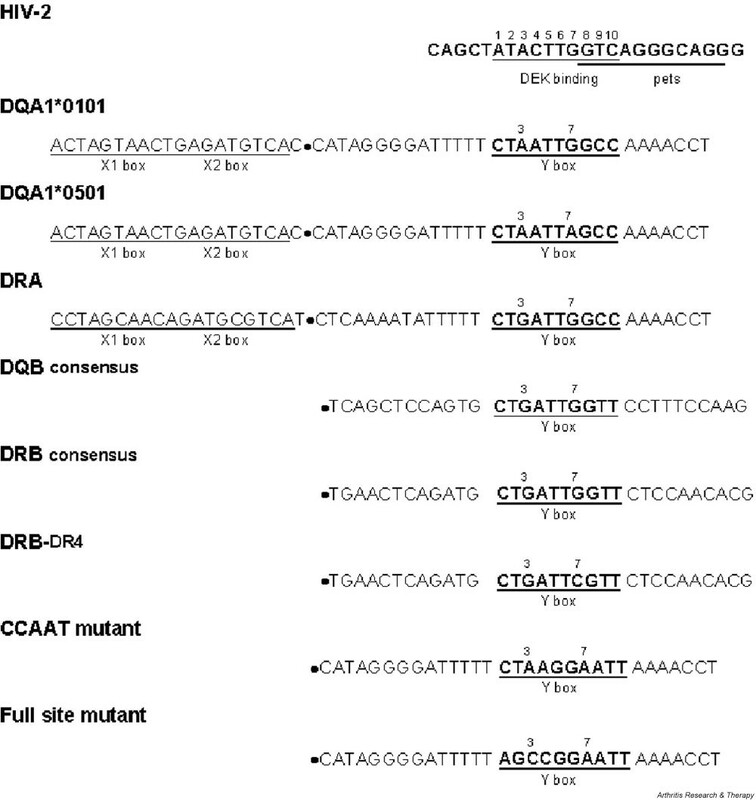 Mutation of the reverse CCAAT sequence, however, eliminates effective competition for binding to the DQA1*0101 Y-box sequence (Fig. 5a, lanes 11–12). Taken together, these results indicate that substitution of adenine at position 3 in the DQA1 Y box for guanine in the consensus Y-box sequence significantly strengthens DEK binding, as do bases at positions 5 and 6 in the reverse CCAAT sequence. Recombinant DEK protein (rDEK) binds in a sequence-specific manner to the DQA1*0101 Y box, but not to the DRA (consensus) Y box. (a) 5 μl of antisense rDEK (lane 2), 5 μg of Namalwa cell nuclear extract (lane 3), or 5 μl of partially purified recombinant DEK protein (rDEK) (lanes 4–12) was used in each EMSA binding reaction; rDEK was preincubated with the indicated unlabelled competitor before addition of the DQA1*0101 Y-box probe. Lane 1 contains no protein. (b) The indicated unlabelled oligonucleotide competitors (20 ng) were added to the binding reaction containing 5 μl of partially purified rDEK before addition of radiolabeled DQA1*0501 probe (lanes 1–4), or radiolabeled DRA probe (lanes 5–8). PolyD(I-C) (10 ng) was added to each binding reaction as nonspecific competitor. EMSA = electrophoretic mobility shift assay. Further characterization of rDEK binding to the polymorphic DQA1*0501 Y-box sequence and to the consensus (HLA-DRA) Y-box sequence establishes a relative hierarchy of DEK binding activity (Fig. 5b). 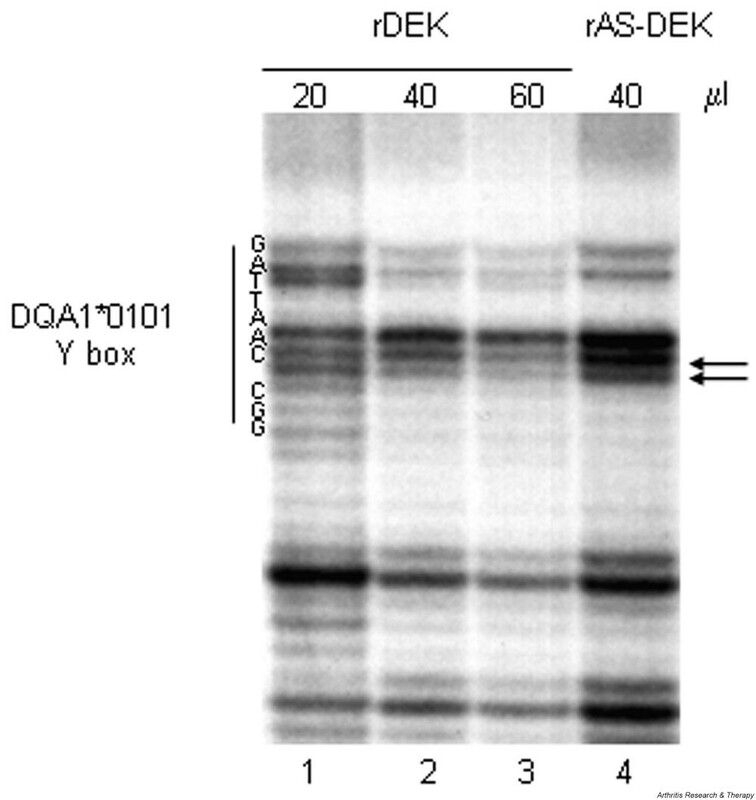 With the DQA1*0501 probe, unlabelled DQA1*0101 sequence (Fig. 5b, lane 3) competed less well than did unlabelled probe. DRA Y box sequence (Fig. 5b, lane 4) and CCAAT mutant sequence (not shown) did not compete for binding. Inability of the HLA-DRA Y-box sequence to compete with the DQA1*0501 probe again indicates the relative importance of the adenine residue immediately 5' to the reverse CCAAT for DEK binding. With the DRA Y-box sequence as probe (Fig. 5b, lanes 6–10), the unlabelled probe sequence competes less well than do any of the other Y-box sequences, suggesting that rDEK alone binds to this sequence nonspecifically and with low affinity. Quantification of the apparent dissociation constant (Kd[app]) for rDEK binding to related class II MHC Y-box motifs validates the relative hierarchy of DEK binding activity described above, and further emphasizes the contribution of gene-specific Y-box polymorphisms to DEK binding activity. As shown in Table 1, DEK binds more strongly to Y-box sequences in either DQA1 allele than it does to any of the other DR- or DQ-related Y-box sequences. It binds least well to the DRA (consensus) Y-box motif, with a Kd[app] that is approximately five times that for the DQA1 sequences. The Kd[app] for DEK binding to DQB is approximately four times that for the DQA1 sequences, whereas the Kd[app] for DEK binding to the DRB Y-box sequences, especially the DRB alleles associated with the DR4 haplotype, are intermediate between the two extremes. Once again, the A-to-G substitution at position 3 in the Y box appears to strengthen DEK binding to the DQA1 Y box in comparison with the DRA Y box; allelic variation in the nucleotide at position 7 in the Y-box sequence (as in DQA1*0501 and in the DR4-associated DRB Y-box sequence) may also mediate subtle differences in DEK binding to otherwise identical sites. Gene-specific sequence polymorphisms outside the Y box per se could also explain why dissociation constants differ where Y-box sequences are identical, as in the DQB and DRB consensus motifs. aMean ± standard error, based on at least three determinations. DNase I footprinting with recombinant protein further defined the physical interaction between DEK and the HLA-DQA1*0101 Y-box element (Fig. 6). Using the noncoding strand as probe, consistent protection is seen over the G at position 7, which is polymorphic in the DQA1*0501 allele (A-for-G substitution) and in the DRB alleles associated with the DR4 haplotype (C-for-G substitution). Consistent protection is also seen at position 2, adjacent to the A-for-G substitution that diverges from the Y-box consensus sequence, although there is no protection of the divergent base itself at position 3. DNase I protection by recombinant DEK extends over the length of the Y-box sequence, including bases within the NF-Y binding site (reverse CCAAT sequence), again suggesting that the two proteins may interact. DNase I footprinting localizes rDEK binding to the HLA-DQA1*0101 Y box. Partially purified rDEK (20–60 μl) was incubated with DQA1*0101 probe (antisense strand). Antisense rDEK (40 μl) (prepared simultaneously with the rDEK protein) was used as a control. The Y-box sequence is shown on the left. Arrows denote consistent protection against DNase I digestion in multiple assays. rAS-DEK = recombinant anti-sense DEK protein; rDEK = recombinant DEK protein. All antigen-presenting cells upregulate MHC class II transcription in response to immune stimulation. We have previously shown that activation of promyeloid cells causes dephosphorylation of DEK and diminished DEK binding to the HIV-2 long terminal repeat [16, 17, 32]. In this study, we show that rDEK can bind to the DQA1 Y box, and that DEK in nuclear extracts participates in the DQA1 Y-box binding complex in vitro. Thus, we propose a model in which intracellular signaling modulates the ability of DEK to bind DNA, causing alteration of MHC class II transcription. Transient transfection experiments in cultured cell lines have not proved useful in examining this model, for DEK is highly expressed in most cells of hematopoietic lineage, and further overexpression has resulted in apparently nonspecific downregulation of transcriptional activity (as might be predicted from ). For this reason, we are currently pursuing other experimental approaches. The DQA1*0501 promoter region (QAP 4.1), in which a single-base-pair polymorphism in the Y box significantly diminishes transcriptional activity , is a component of the so-called susceptibility haplotype for autoimmune disease. The DQA1*0501 allele is strongly associated with early-onset pauciarticular JRA in Northern European populations [23, 24] and with increased risk for juvenile dermatomyositis  and Sjögren's syndrome with high autoantibody production [26, 27]. In our proposed model, aberrant class II MHC regulation could result from altered DEK binding and/or interaction with NF-Y, and aberrant class II expression may alter or enhance reactivity against DEK-derived or other self peptides. The C-terminal region of DEK, which contains the putative DNA-binding domain, appears to be most antigenic  (and K Sitwala and DM Markovitz, unpublished observations), raising the possibility that altered DNA binding may expose other masked epitopes. Development of antibodies to DEK could even be a primary event in the pathogenesis of JRA, with disruption of nuclear events due to penetration of anti-DEK antibodies into living cells . It remains to be determined whether anti-DEK antibodies are directly involved in the pathogenesis of autoimmune disease, or if they result from generally enhanced immunoreactivity. Three specific findings in this report support a potential role for DEK as a transcriptional modulator of MHC class II expression. One is that DEK binds to the HLA-DQA1 Y box in a sequence-specific manner. Another is that NF-Y and DEK both participate in the HLA-DQA*0101 Y-box binding complex, which coordinates DQ protein expression. Finally, DEK binds differentially to specific Y-box sequences found in HLA-DQA1(*0101 and *0501 alleles) and HLA-DRA, consistent with observations of DQA1 gene-specific cell-surface expression  and allele-specific promoter activity . The specificity of rDEK binding to these and other, related Y-box sequences (including HLA-DQB and HLA-DRB alleles associated with the DR4 haplotype) may correlate with a predisposition to autoim-mune disease seen with certain HLA haplotypes. We thank W Szer for human anti-DEK serum, J Ting for anti-NF-YA antibody, and D Glass for multiple helpful discussions. This work was supported by grants from the Arthritis Foundation Michigan Chapter (BSA), the Arthritis Foundation (BSA, DMM), the American Cancer Society (DMM), and the National Institutes of Health (AI36685).